PACS1 Syndrome is characterized by intellectual disability, developmental delay, and mildly distinctive facial features. People with this Syndrome may also have seizures, difficulty eating and gaining weight, and autism. As of 2017, about 70 people have been diagnosed with this Syndrome. However, since the first cases of the Syndrome were only published in the medical journals in 2012, the number of children and adults found to have the Syndrome may increase. PACS1 Syndrome is caused by a specific change or mutation in the PACS1 gene. So far, this genetic change has not been found in the parents of a child with PACS1 Syndrome. This means the change in the PACS1 gene most likely happened during the making of the egg or the sperm. PACS1 disorder is suspected when a doctor sees signs of the Syndrome such as intellectual disability and the characteristic facial features. Genetic testing of the PACS1 gene is needed to confirm the diagnosis. Treatment for PACS1 Syndrome depends on the signs and symptoms each person has, but may include medications to prevent seizures, and speech, physical, and occupational therapies. Signs of PACS1 Syndrome include intellectual disability, developmental delay, and mild distinctive facial features causing those who have the Syndrome to look a lot alike. The typical facial features include having a low hairline on the forehead, eyes that are spaced far apart (hypertelorism) and slanting downwards, thick eyebrows that may be connected to each other, long eyelashes, large ears that are set low on the head, and gaps between the teeth. Children with PACS1 Syndrome may have speech delay and low muscle tone (hypotonia). Babies with the Syndrome may also have certain problems that are present from birth (congenital) including abnormalities of the heart, brain, eyes, or kidneys. Some boys with PACS1 Syndrome may have undescended testes (cryptorchidism). People with PACS1 Syndrome may have other features including near-sightedness (myopia), seizures, difficulty eating, and autism. PACS1 Syndrome is caused by a specific change or mutation in the PACS1 gene. The PACS1 gene acts like a blueprint and tells cells how to make the PACS1 protein. The PACS1 protein is found in the membrane of the Golgi apparatus. The Golgi apparatus acts as the shipping and packing department of a cell. It modifies other proteins to prepare them to be shipped to other parts of the cell or outside of the cell. Scientists believe the job of the PACS1 protein is to help get proteins into and/or out of the Golgi apparatus. Scientists also know that cells make a lot more PACS1 protein during the development of the brain and make very little of the protein after birth. Scientists are working to understand how the ability of the PACS1 protein to do its job is changed in cells of people with PACS1Syndrome. PACS1 Syndrome is an autosomal dominant Syndrome. This means that only one copy of the PACS1 gene must be changed in each cell of the body in order for a person to have signs and symptoms of the Syndrome. Remember, genes come in pairs (two copies) and one copy is inherited from each birth parent. In every case of PACS1 Syndrome that has been found so far, the change in PACS1 gene is new and not found in either parent. This means that the genetic change was not passed down from either the mother or the father, but instead occurred for the first time (de novo) in the child who has the Syndrome. In other words, the change in the PACS1 gene happened by mistake during the making of the egg or the sperm. 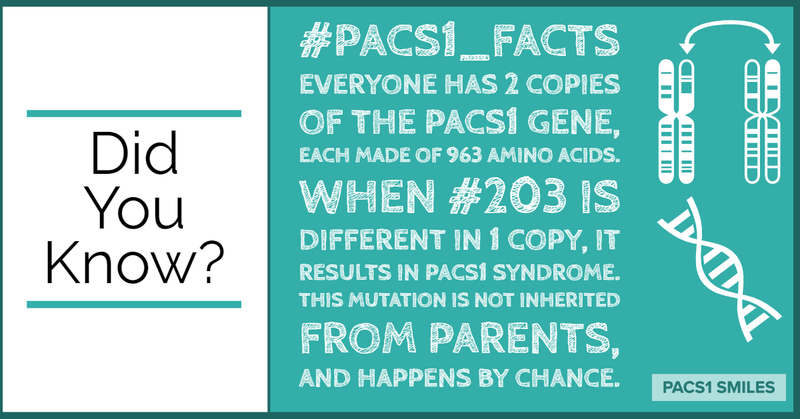 If two parents have a child who has PACS1 Syndrome and neither parent has the change in their own copies of the PACS1 gene, the chances that the parents will have another child with PACS1 Syndrome is less than 1%. People with PACS1 Syndrome have not been known to have children so far. Theoretically, if someone with the Syndrome were to have children, there would be a 50% chance for each child to have PACS1 Syndrome as well. PACS1 Syndrome may be suspected when a doctor notices signs and symptoms that are commonly found in children or adults who have the Syndrome, such as intellectual disability and mildly distinctive facial features. The diagnosis is confirmed by finding the specific change in the PACS1 gene through genetic testing. In many cases, the doctor may not initially suspect PACS1 Syndrome because the Syndrome is so rare and most of the signs and symptoms are not unique to this Syndrome. Therefore, PACS1 Syndrome is frequently diagnosed with a very broad genetic test called whole exome sequencing. Ultrasound of heart and kidneys. Although there is no cure for PACS1 Syndrome, there are treatment and therapy options that can help manage many of the signs and symptoms of the Syndrome. Anti-epileptic medications can be used to help control seizures. Sometimes, children with PACS1 Syndrome may need feeding tubes to help them get enough nutrients. Children with PACS1 Syndrome may be recommended to be followed by a developmental pediatrician, and they may benefit from speech, physical, and occupational therapy. Some children and adults with PACS1 Syndrome are better able to communicate if they learn sign language or have an electronic device to help them communicate. Because PACS1 Syndrome is so rare, there is not a lot of information about the long-term outlook for children and adults with the Syndrome. PACS1 Syndrome is not known to shorten a person’s lifespan. People with PACS1 Syndrome will likely need extra help in school, such as special education classes. They will also need to be monitored throughout their lives to make sure they do not develop any additional health issues.